The BPR Foundation sponsors the shuttle for San Clemente’s Summer Artwalk.The Friends of Beaches, Parks and Recreation Foundation, which has financially supported multiple recreational and cultural causes in San Clemente, is directing its attention to helping to raise funds for San Clemente’s planned Aquatic Center at Vista Hermosa/La Pata Community Park. The first major event will be a spring golf tournament at a time and place to be determined. The group continuously seeks the help of San Clemente community members for cash donations or pledges, volunteers to help with fund-raisers and identifying major sponsors. Foundation directors concur with the recommendation of a three-pool swimming complex by the City Parks commission, with all the necessary amenities, which, along with soccer and baseball fields in the first phase of development, will cost twenty million dollars. Current City funds dedicated to this project have been estimated at around 13 million. The decision to initially to build the full complex or a substantial part rests with the San Clemente City Council. Initially, the Foundation has earmarked $10,000 for the pool project, most raised from the May Bike Race in Talega. The Foundation has identified potential uses for donated funds and established a special Aquatics bank account for the naming rights of pool lanes, plants and trees, benches, pool maintenance equipment, garden furniture, and other essential amenities. Several Foundation board members have inspected aquatic centers in other cities such as Santa Cruz, Sacramento, West Covina, and Beverly Hills to gain ideas for inclusion in San Clemente’s forthcoming complex. 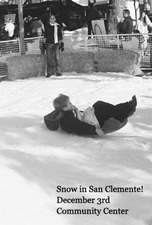 This year the Beaches, Parks and Recreation Foundation is chipping in to bring snow to San Clemente for the second annual Snow Hill Day on December 3rd, Call the Recreation Department for more information 361-8265.When the Foundation first organized at Rick Anderson’s Tropicana Grill in late 2000, Marblehead developer Jim Johnson wrote a one thousand dollar check to begin the treasury, and along with directors Mark Cousineau and Bill Hart, both active members of the Surfrider Foundation, cited a future pool complex as a fundraising goal. 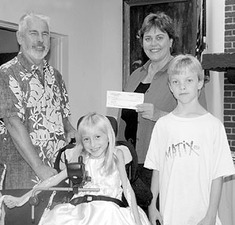 Since that time, the Foundation has concentrated on other community needs: $5,000 for Courtney’s Sandcastle, a forthcoming Marblehead Coastal park for both able and disabled children; $5,000 to the new Semper Fi park at the Pier Bowl; an annual $2,000 scholarship fund for needy children to participate in such recreational programs as dance, swimming and art; Summer Concerts at the Pier (4 years); cutting boards for the pier fishermen; lighting and sound equipment for the community theater; and bleachers for the Ralph’s Skatepark. One of the Foundation’s most successful accomplishments has been the SrNet Cyber Café, through which some 600 local seniors have gained computer skills. The Cyber Café, located at the RIO Center, has nine computers obtained through a grant from the national Parks Society. Twenty volunteer instructors have been conducting classes four times a year - featuring beginning computers through digital photography - for four years. To encourage use of San Clemente’s open spaces and trails, the organization sponsored two Ridge Trail Bike/Hike/Run events and it has more on the drawing boards. Additionally, the Foundation nurtured the early stages of both the San Clemente Amphitheater group and the Dog Lovers in gaining non-profit status, aiding the latter organization in developing the Baron Von Willard Dog Park. Over the past four years, annual skateboard tournaments have been held, attracting up to 150 young contestants showing their individual skills in 90-second individual demonstrations. Popular professional Tony Avila MCees the event and coordinates the judging. If you wonder what happens to all the items lost on our beaches, you need not inquire further. The Robin’s Nest Thrift Shop sells these reclaimed, mostly recreational, articles: surfboards, fins, wetsuits, dark glasses and boogie boards at bargain basement prices, and turns the income over to the Foundation for distribution. One of the ongoing sources of funds is the Foundation’s income from vending machines at selected parks, the community center and the San Clemente railway station. Anyone interested in donating time or money to the Foundation and its causes, is invited to telephone (949) 492-4585 or email lynnay@cox.net.